A quern is the 10,000-year old Cuisinart. The photo I am using today is of a quern found in southern Arizona and set outside the door to the park headquarters of Organ Pipe National Monument, I recognized it because I’ve written about querns in the past! A Quern is two rocks fitted out to grind stuff between them, generally to grind grain into flour. There are many, many designs of querns but in all of them, the bottom rock is some variation on a roundish flattish rock, the top rock is designed in some way that allows that rock to be swiveled or churned in a steady way over the bottom rock. 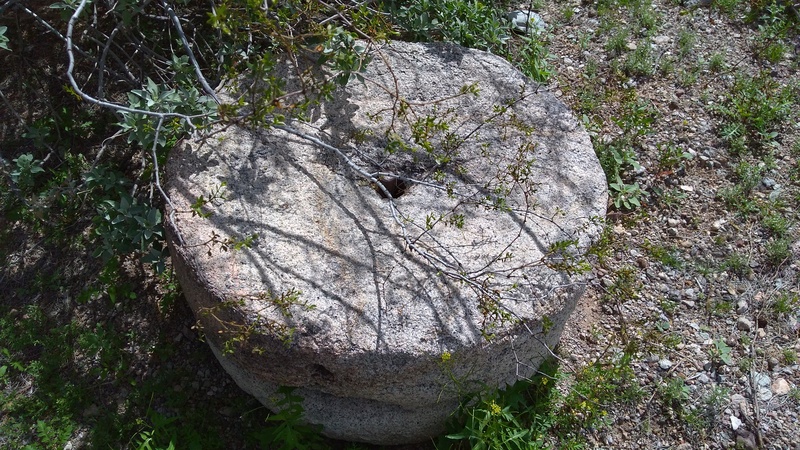 This 2-rock system is called a Quern. To be more precise, the bottom rock is the quern, the top one is a handstone. If you want to know more, go to Wikipedia and follow the crazy words. Like nixtamalization using a metate; Maya words for this machine and process. Or, in Scotland there was thirlage; which was the manor-run area in which you lived where you were forced to hire the local miller to grind your grain - so that the local lord and lady and miller could earn more money from your hard work and your crop. If you had a quern, you had to hide it. If they found it - they broke it, which is why museums in Scotland today have a lot of broken querns. You have probably heard the rumor that poor Scots people were not fond of obeying laws imposed on them by lords, ladies, and the Brits. A quern is a heavy, useful 2-part machine that shows us that being human has always required a wagon load of muscle with a dollop of smarts. People figured out they liked to eat grain. They figured out that if you beat the grain up a bit, you could make bread and many other helpful, sometimes tasty, generally filling foods. A quern is a tool that allowed groups of people to work together in families and teams, to divide up the work and make a meal. It was a tool to radically multiply sources nourishment for humans. A quern was one of humankind’s first assets. With it a community had a way to get through a variety of seasons and weather patterns. It helped turn this month’s bumper crop into flour with which to sustain the community months from now. Querns helped even out the ups and downs, rains and droughts. It helped turn the inedible into supper. It made it possible for people to live a distance from their fields of grain. It allowed commerce, turning harvest into commodity. The individuals, family, tribe, community who owned and controlled the quern – became the ones who could rule others. It was a tool for sustenance. It could also become a tool for wealth, exploitation, and power.